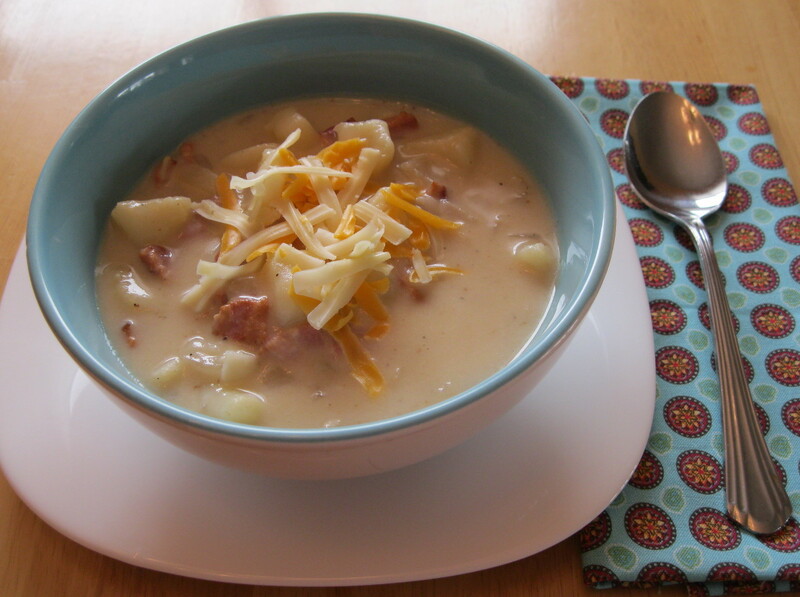 I was chatting with my sister this morning, and she happens to mention she’s planning on making potato soup for lunch, and she’s using our mom’s recipe from old days. Marvelous, I thought, me too! So hubby was completely happy, as he’s Mr. Potato-Lover. 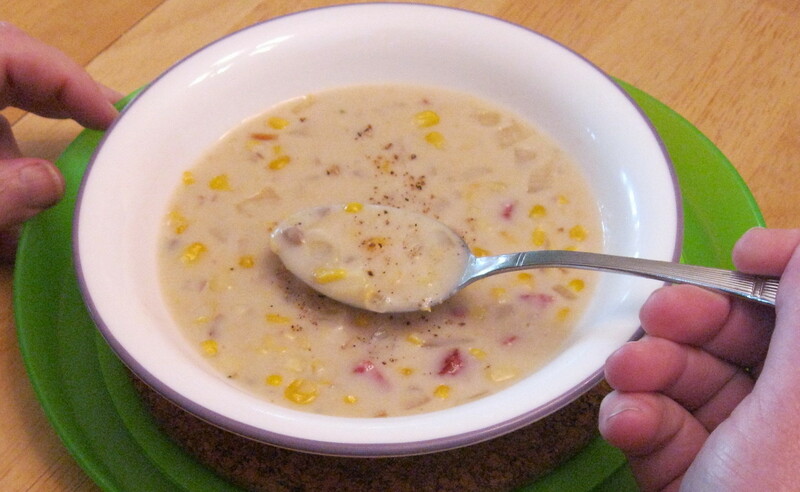 It’s sort of like corn chowder (one of my favorites) only with tender, bite-size pieces of potato instead of corn. And there still a few ‘taters from last fall’s harvest in the cold storage, so bob’s your uncle…lunch! Sauté diced onions in a bit of butter or oil till translucent. Peel and dice potatoes. 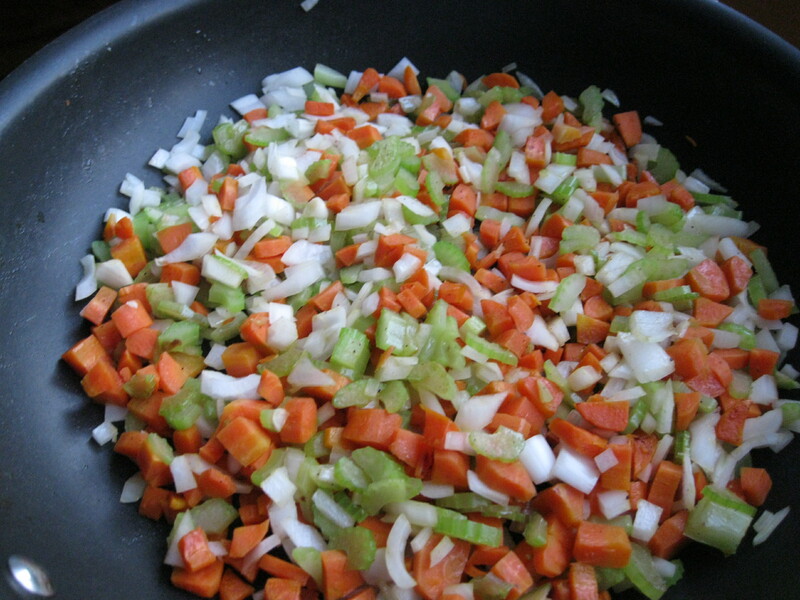 Add potatoes and sautéed onions to a saucepan, and cover with water. Stir in ½ tsp salt and cook till tender, about 15 minutes. Stir together sour cream, flour, pepper to taste, pinch of paprika, and vinegar. When potatoes and onions are tender, remove from heat. Stir in sour cream mixture and crumbled bacon . 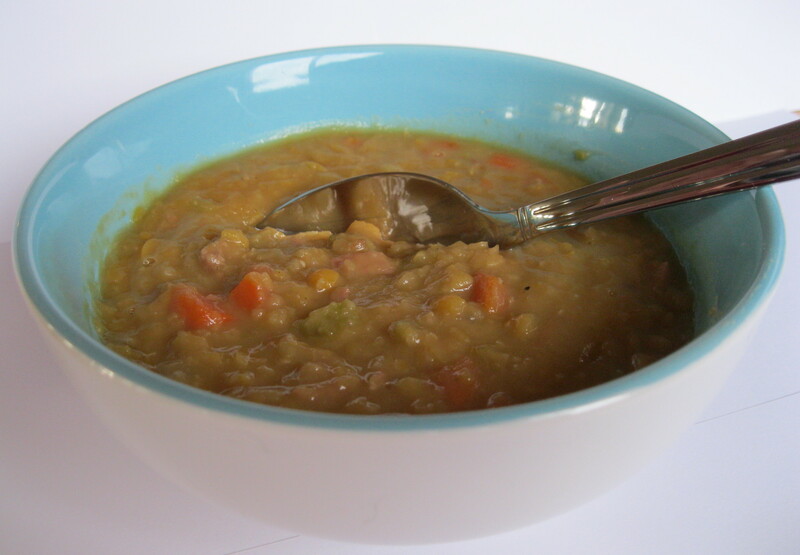 Return pot to low heat and simmer soup until thickened and creamy. Add milk to thin if necessary. Ladle into serving bowls and sprinkle with grated cheese for garnish. Makes about 3 – 4 servings. In a large pot, cover your ham bone (hopefully it has some nice meaty bits still clinging to it) with cold water. Roughly chop a large onion and several (3-5) stalks of celery, including the leafy stems. Add to the pot. Season with your favorite seasonings, I put in 3 bay leaves and some salt and pepper. Bring to a boil and then reduce to a slow simmer. It will take at least 3 hours to make a rich stock. Once the stock is to your satisfaction, remove from heat, and when it’s cooled a bit, fish out the ham bone and the meaty pieces. Strain the broth until clear. Discard the mushy veggies. Cut meat into small pieces and reserve in the fridge. Skim off undesired fat from the top of the broth. Return the clear stock to the stove with a couple of bay leaves and taste to adjust seasonings. 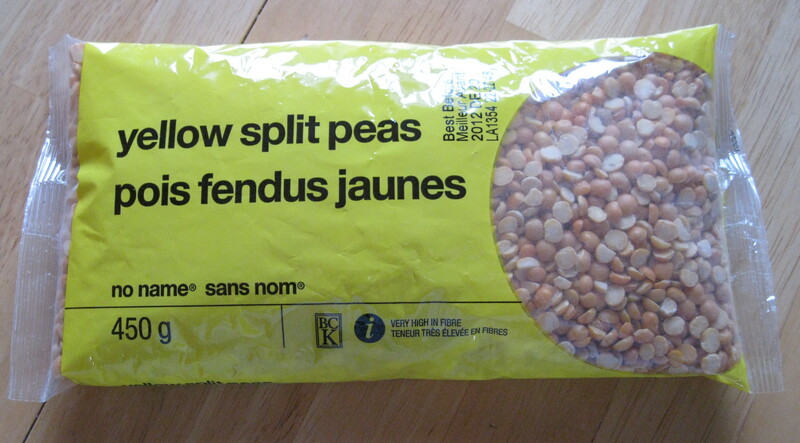 Pick over and rinse the split peas, then add to the stock. Use 1 cup per about 3 cups broth (a guesstimate of the amount of broth is fine). Over a medium simmer, let the peas cook until tender, about an hour. At this point, if you prefer a smoother texture, use an immersion blender to puree the mixture, or you can even just mash a bit with a potato masher for a courser texture (which is what I did). While the split peas are cooking, prepare the vegetables. For about 6 cups broth, I used 3 carrots, 1 large onion, 3 ribs of celery and 3 cloves of garlic. Dice and saute the veggies in a bit of oil or butter for about 4-5 minutes. Sprinkle with salt and pepper if desired. Add the sauteed vegetables to the stock along with the reserved meat. Turn heat to low and let the soup simmer until vegetables are desired tenderness. When you need something easy and fast to put together for lunch, or even a light supper, this soup is it. Dice bacon, fry and drain, set aside. Dice onion, saute till tender, but not browned. 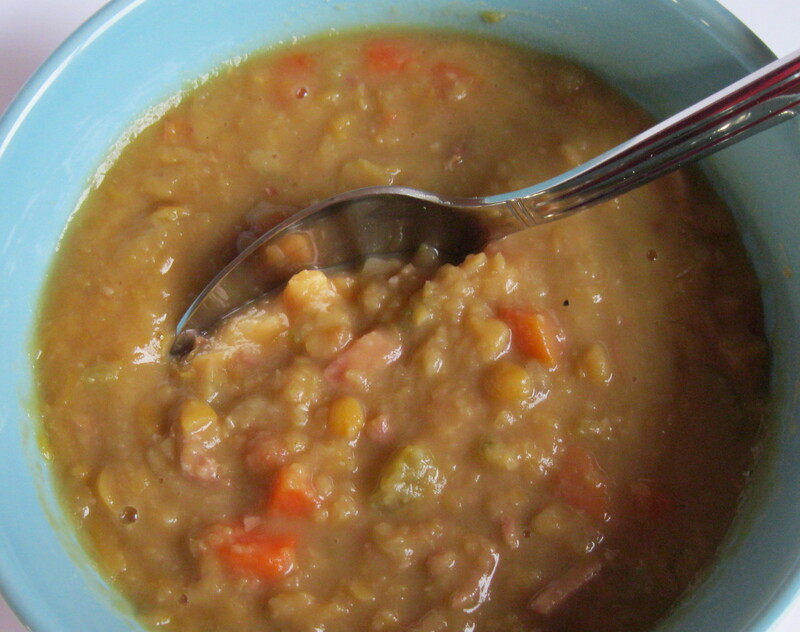 Mix corn, soup and milk together in a pot. Stir in cooked bacon, sauteed onion and seasonings. Simmer till hot and bubbly and flavors have a chance to mingle . Makes about 5 cups of soup. If you’re in a big hurry, use the microwave. The results are just as good, and you won’t have to stand and stir the pot. Variations: Use your favorite smoked sausage, back bacon or ham instead of bacon, or leave the meat out altogether and add some potato, celery and grated carrot instead. Finely chopped and sauteed mushrooms also add another taste dimension. 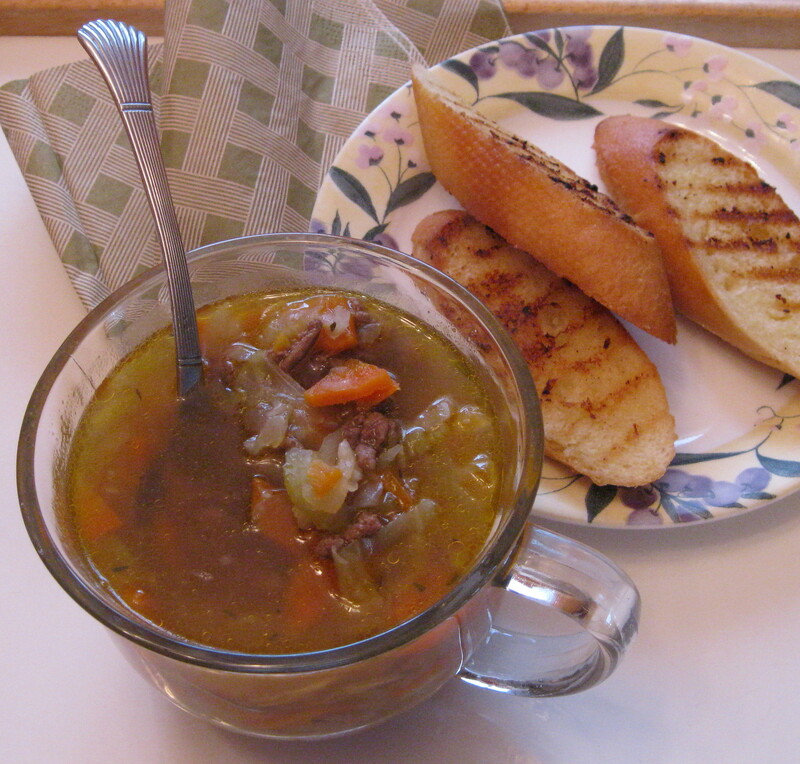 No sign of spring yet, it must be time to cook soup. Prep veggies, peeling, chopping, shredding as necessary. Meanwhile, in a large pot, combine beef broth, water and bay leaves and begin to warm over low heat. In a large frying pan over medium heat, add oil or butter and saute each of the vegetables in turn, sprinkling with a pinch of salt and a bit of pepper, until softened, being careful not to brown them. The garlic may be added in with the onion. As each vegetable is done, add it to the simmering broth. Brown the ground beef with 1/2 tsp salt, pepper to taste, and cloves. Drain well and add to broth. Continue to simmer for another 10-15 minutes, until vegetables are desired tenderness. Taste and adjust seasonings as needed. If desired, stir in tomato paste and rice. Discard bay leaves before serving. Makes about 8 servings.